There once was a poor baker who had a lovely daughter. They lived in the seaside town of Sorrento. The king of Italy wanted to celebrate the festival for San Valentino, Valentine’s Day. “Who makes the best pasta in all of Italy?” he asked. “You must go to the baker on Via Capo in Sorrento. He makes the best pasta of all.” And so the king did. “Is is true that you make the finest pasta in all of Italy?” the king asked. The baker fibbed, "I do make good pasta, but my daughter makes the finest pasta in the land." "If that is the case, bring her to my palace tomorrow, and I will put her to the test." There the poor baker’s daughter sat. She did not have the least idea how make pasta from flour. “Ai, ai, ai,” she wailed. "What will you give me," said the little man, "if I do it for you?" "I will give you this seashell I found on the shore," she said. The little man took the seashell and placed it in his pocket. He stood by the table, poured many cups of flour into a big bowl, a bit of salt, fresh eggs and a pitcher of water. Stir, stir, stir, and roll, roll, roll. In no time at all he had a nice batch of fresh pasta. He cut in into ribbons and set it out to dry. Early the next morning, the king strolled into the kitchen. When he saw the pasta he was delighted, but still he wanted more. He took the baker's daughter into another room which was much larger and had even more flour and salt, eggs and water. “Make all of this into pasta if you value your life,” he commanded. “Ai, ai, ai,” she wailed. "I will give you this fine fish I caught at the beach," she said. The little man took the fish and placed it in a pan. He fried it up for his supper. Then he stood by the counter, poured many cups of flour into a big bowl, a bit of salt, fresh eggs and a pitcher of water. Stir, stir, stir, and roll, roll, roll. In no time at all he had a nice batch of fresh pasta. He cut in into ribbons and set it out to dry. Even if she is just a lowly baker's daughter, thought the king, I could not find a better cook in the whole kingdom. "I am a poor baker’s daughter. I have nothing left that I can give," said the girl. That is not likely to happen, thought the baker's daughter. Not knowing what else to do, she promised the little man that she would give him her firstborn child. Then the little man poured many cups of flour into a big bowl, a bit of salt, fresh eggs and a pitcher of water. Stir, stir, stir, and roll, roll, roll. In no time at all he had a nice batch of fresh pasta. He cut in into ribbons and set it out to dry. When the king came in the morning and found all as he had wished, he took her in marriage, and the pretty baker's daughter became a queen. The following spring, the new queen gave birth to a darling daughter. She never gave a thought to her promise to the little man. One afternoon, he came into her room, and said, "Now give me what you promised." "No, no and NO!" replied the little man. “Is it Alfonso, Alfredo or Bertoldo? “Is is Modesto, Nico, Orlando? I dance by the flame. She can shout and can whine. When the queen she heard this, she was overjoyed. The next afternoon, the little man returned. "Now, lovely queen, what is my name?" he asked. At first she said, "Is your name Alberto?" "Then perhaps your name is Rumpelstiltskin?" At this, the little man stamped his feet and called aloud, “How did you guess?” but the queen would not say. “If I cannot have your child, I must work at the castle as pasta maker. I have come to enjoy the work. Furthermore, I am very good at it,” he said with a smile. The queen agreed. From that day forward, the people of Italy had all the pasta their hearts desired. I really liked the retelling but I wish the man's name wasn't Rumpelstiltskin. I think it would have fit more with the rest of the story to have a crazy Italian sounding name. I liked having the original flavor of the old story carried forward as well as the new? ending. However, I wish someone had proofed it for errors. 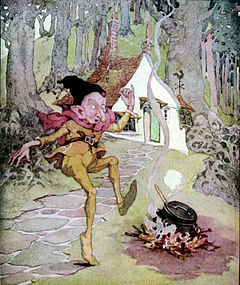 I liked the retelling, but was surprised to find the little man was Rumplestiltskin. For him to want to stay on as pasta maker in the kitchen didn't feel real to me. Nice, flowing story. I was pulled through the story in a fun way, wanting to know what would happen next and next. Resolved with good believable satisfaction. I liked this old favorite in a new setting and with a new ending. I never cared for the original ending.